New Release July 2018: Snack Healthy, Snack Happy! 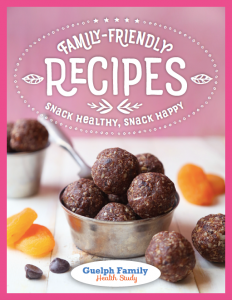 The new cookbook and cooking videos are focused on healthy, kid-friendly snacking. Snacking makes up a large portion of the calories we consume on a daily basis, and as any parent will know, snacks are an important part of a kid’s day. However, nutrition counts, and unfortunately many of the go-to “kid-friendly” snacks we find on grocery store shelves just don’t stack up. To support kids’ healthy eating, researchers from the Guelph Family Health Study (GFHS) partnered with the Helderleigh Foundation and George Brown College Food Innovation and Research Studio (FIRSt) to create recipes that help make even the tiniest bites count. The snacks in this cookbook are high in nutrients and foods that children often don’t get enough of — fibre, fruits, vegetables, dairy and omega-3 fats — and low in the ones they get too much of — sugar and salt.